Galilee is a historical region in northern Israel, on the border with Lebanon. It is bounded by the Mediterranean Sea in the west, the Jezreel Valley in the south and the Jordan Valley in the east. The North, Upper Galilee and the southern, Lower Galilee, are shared by the Beit Ha-Kerem Valley (“Vineyard of the Lord”), stretching from west to east from the city of Acre on the Mediterranean coast to about the city of Khorazin. From Samaria, Lower Galilee is separated by the Jezreel Valley – the most fertile region of Israel. Galilee is a historical region in northern Israel, on the border with Lebanon. It is bounded by the Mediterranean Sea in the west, the Jezreel Valley in the south and the Jordan Valley in the east. The North, Upper Galilee and the southern, Lower Galilee, are shared by the Beit Ha-Kerem Valley (“Vineyard of the Lord”), stretching from west to east from the city of Acre on the Mediterranean coast to about the city of Khorazin. From Samaria, Lower Galilee is separated by the Jezreel Valley – the most fertile region of Israel. The valleys of the Lower Galilee stretched from west to east, therefore, since antiquity, trade routes from the coast of the Mediterranean Sea to the Sea of ​​Galilee passed through them, which contributed to the formation of cities. Galileo was held for 2 days. In the northernmost part, along the Hula valley to Lebanon goes the so-called Galilean finger. 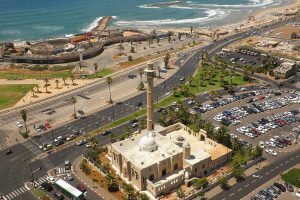 The coastal region (the narrow Mediterranean coast from the settlement of Rosh Ha-Nikra to the city of Akko) is called Western Galilee. Upper Galilee is a mountain range. 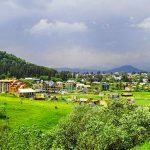 Its eastern highlands with the highest peaks in the country (Mount Meron, 1208 m above sea level) passes north into the Naftali Range, which stretches along the Hula Valley. 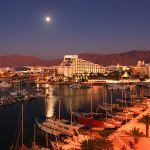 The largest cities in the region are Acre, Nahariya, Nazareth, Safed, Karmiel, Afula and Tiberias. 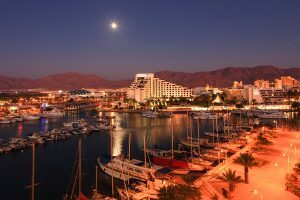 The port city of Haifa serves as a shopping center for the entire region. Agriculture (livestock, cultivation of olives, apples, pears, avocados, apricots, tobacco and cotton), fishing and tourism are developed. There is a canning, textile, wood and metalworking industry. In the 1970s, the industrial zones Tefen, Segev and Tyr’an began to develop, industrial enterprises of agricultural settlements, urban industrial centers in Karmiel, Ma’alot, Safed, Shlomi, Kiryat Shmona, health-improving treatment (hot healing springs and mud of Lake Kinneret , mountain resorts of Safed). Galilee is repeatedly mentioned in the Bible: King Solomon gave 20 cities of Galilee to Tyr (Lebanese) Prince Hiram (1 Kings 9:11). The pagan Galilee is mentioned by the prophet Isaiah (Is. 9: 2). By the time of Jesus Christ, the Galilean Jews had a special dialect of Judeans (Mark 14:70). Most of the apostles were Galileans (Acts 1:11). The main cities of Galilee were Bethsaida (the birthplace of the apostles Andrew, Peter and Philip – John 1:44), Cana of Galilee (the birthplace of Nathanael – John 21: 2) and Nazareth (the birthplace of Jesus Christ – Matt. 2:23; Matt. 21: eleven). The Jews of Jesus Christ revered the Galilean (Matthew 26:69; John 7:41). According to Matthew after the resurrection, both the angel and Jesus sent the apostles to Galilee (Matthew 28: 7-16). In the era of the Apostle Paul, churches existed in Galilee (Acts 9:31). It is in Galilee you can see the beauty of the Israeli landscape. Their diversity and contrast is observed in everything: in the famous waters of the Jordan; in religious and historical centers that stretch from Safed to Nazareth, from Tver to Capernaum and Acre; in nature reserves, which amaze tourists with their picturesque nooks, majestic mountain waterfalls, exotic flora and fauna; in archaeological monuments, ranging from the Roman city of Beit Shean, from the unusual baths of Hammat Gader and ending with unique ancient mosaics and the fortress of the Crusaders, which was built on a hilltop. 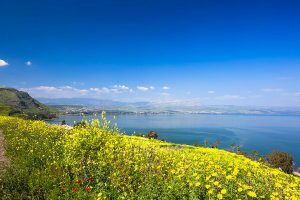 At any time of the year, the Galilee of Israel is beautiful and open to travel that is very diverse. This and tourist excursions, and religious, cultural trips, medical or beach holidays. All the beauty of this area can not be transferred. Mountain streams, which originate from the hills of the Upper Galilee, flow into the legendary Jordan River, which flows into the famous Genisaret Lake (Sea of ​​Galilee). The Israeli Galilee (after Jerusalem) is considered to be the richest place of all kinds of sights. 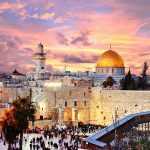 And the question: “Where to rest in Israel?” – for those tourists who have ever seen Galilee, is simply not worth it, they again without hesitation go to this beautiful corner of the earth. Western Galilee is considered to be a fairytale land in northern Israel. In this corner of the country, even on the hottest days, you can feel the damp coolness of evergreen groves, accompanied by the singing of birds and the sound of brooks – a real paradise! 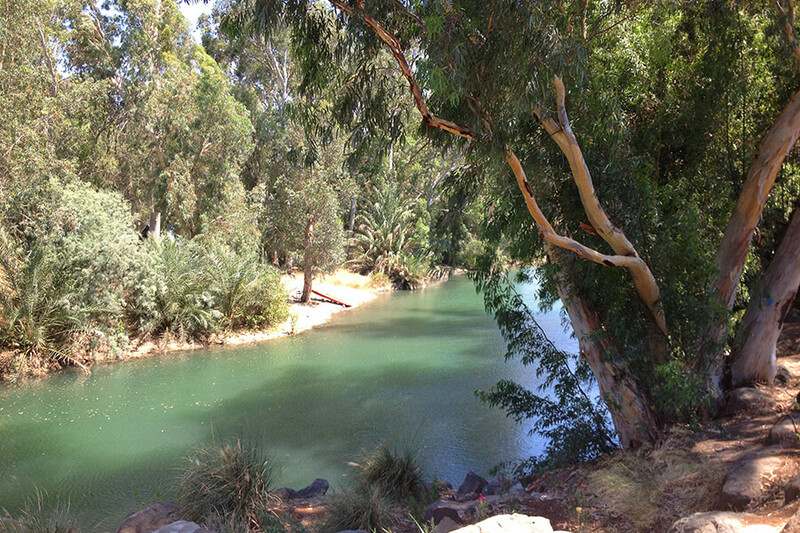 In addition, the Galilee of Israel is rich in national parks, which still retain signs of antiquity. In Galilee there are many holy, Christian places. Historic sites such as Capernaum tell about the period of early Christianity. Among the numerous monuments located in Galilee, there are those that show a pronounced improvement in the construction of synagogues and ornaments in the form of magnificent mosaics, which can be seen, in particular, by visiting Zippori. The past here still retains its spirit, and tourists can feel it themselves. 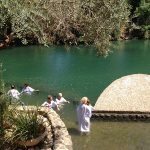 In addition to sightseeing tours to Galilee, pilgrim tours in which pilgrims of all denominations take part are considered to be equally popular. 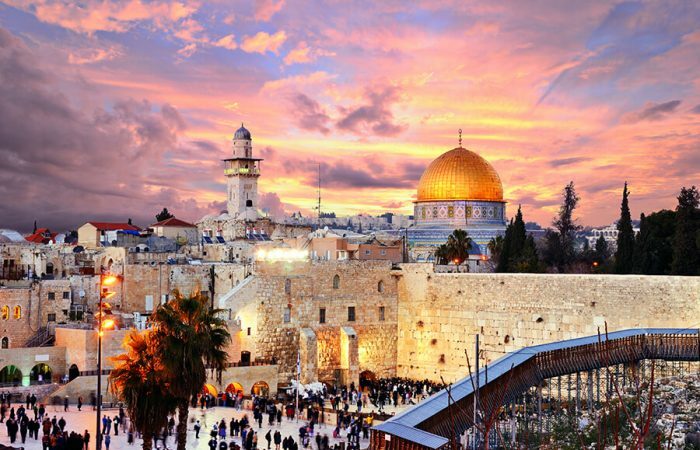 So, Christians try to visit places that are related to the beginning of the messianic ministry of Christ. 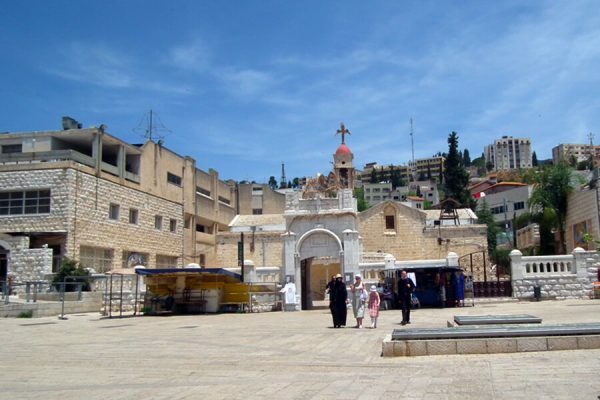 These places include Nazareth, where the Annunciation took place and ran through the entire childhood of Jesus, places such as Tabgha, Kana and Kursi, in which Jesus first began to work his miracles. The popular place of pilgrims includes Mount Tavor, where the Transfiguration took place. Many of them rush to the southern tip of Lake Gennesaret. Here is the place of pilgrim baptism – Yardenit. The descent to the Jordan River is arranged there in such a way that people in wheelchairs can descend on it. 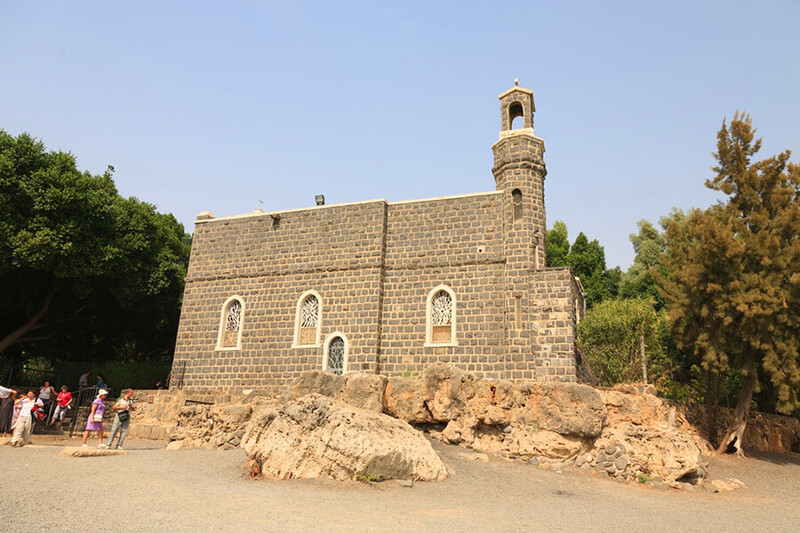 In Galilee, there are also a huge number of mosques built during different periods. 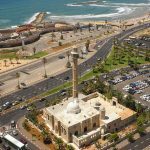 The most beautiful is the mosque in the city of Acre, which was built by order of the Turkish Sultan El Jazzar. Six kilometers from Nazareth is the ancient city-fortress, one of the best national archaeological parks – Zipori, the historic capital of Galilee. The city is located on the top of a picturesque hill, which has a height of more than 300 meters. Here you will see the remains of a gigantic Roman theater, funerary caves, ruins of the crusaders’ fortress, as well as the famous mosaic known as Mona Lisa from Galilee (Galilean Mona Lisa). Giant underground hydraulic structures, built in the first century AD, amaze with their engineering art and size. 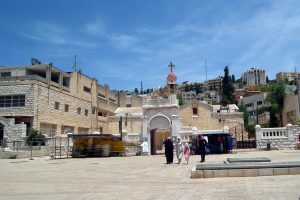 Safed (in the Russian tradition – Safed) is one of the four holy cities for Jews, along with Jerusalem, Tiberias and Hebron. Located at an altitude of 900 m above sea level, on top of one of the mountains of the Upper Galilee. Today in Safed there are numerous active synagogues and yeshiva. Safed is famous for its quarter of artists, galleries and workshops, in which the works of local craftsmen are displayed. On the territory of the artists quarter there are synagogues known in the Jewish world. In the 16th century, Safed became a Jewish financial and religious center, attracting many pilgrims from Europe and North Africa. Kabbalists flocked to Safed, turning the city into the world center of Kabbalah. Safed is a city of unusual architecture, due to the fact that the streets here go from top to bottom and they were built up in antiquity by people from different countries. In Safed, the annual World-wide Safed Festival of Kleizmer Music, the largest in the world in this musical genre, is held. Near Safed there are numerous graves of Jewish sages of past times. One of the most famous is the tomb of Rashbi, Rabbi Shimon bar Yohai and his son. On the anniversary of his death – Lag B’Omer – on the 33rd day after the first day of Passover, hundreds of thousands of people come to his grave. Tveria (English Tiberias) is a city on the western shore of Lake Tiberias (Kinneret Lake) in Galilee. One of the four holy cities for the Jews (Jerusalem, Hebron, Tiberias and Safed). 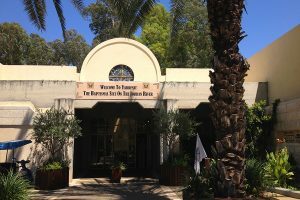 Every year, tens of thousands of people flock to Tiberias to visit national shrines: the tombs of Rambam (Rabbi Moshe ben-Maimon-Maimonides), Rabbi Johanan Ben-Zakkaya and Rabbi Akiva. Among the attractions are the ruins of the synagogue (VI century), as well as the remains of the ancient Jewish city of Hamat Tiberias (I-IV century AD.). On the basis of 17 sources with a temperature of up to +63 ° C and therapeutic mud, the balneological resort complex Hamey Tiberias operates. 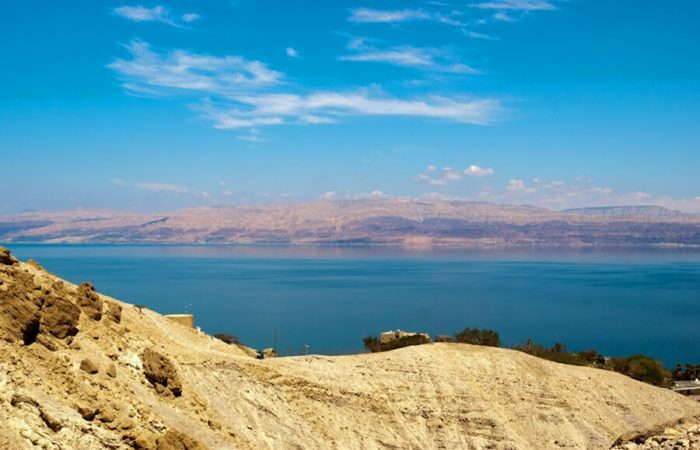 The lake of Genisareth or Tiberias, better known as the Sea of ​​Galilee, is called Lake Kinneret in modern Israel. The coast of the lake is one of the lowest land areas on Earth – on average, 213 m below sea level. This is the lowest freshwater lake on Earth. The water level is subject to changes throughout the year depending on precipitation and water consumption. The maximum depth is 45 m, the area is on average 165 km². 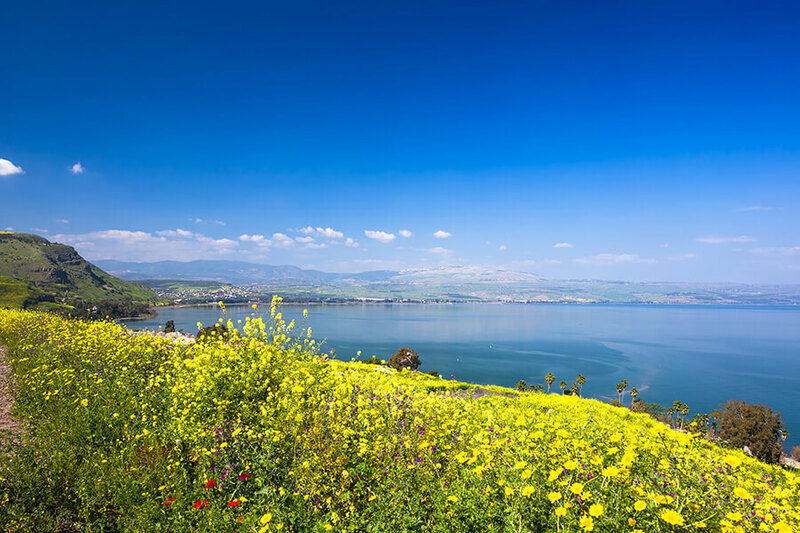 From the north, several rivers flow into the Kinneret, originating in the Golan Heights, including the Jordan River. 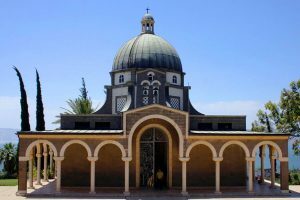 The coast of the lake is associated with many episodes from the life of Jesus Christ and is therefore popular among Christian pilgrims. On the shores of the Sea of ​​Galilee, according to the Gospel, the Lord chose his disciples, called them to the apostolic ministry. Here He preached, performed many miracles, and appeared to the apostles after His Resurrection. Yardenit (derived from the diminutive Jordan) is a place where the Jordan River emerges from Lake Tiberias (Kinneret Lake), as well as a complex of buildings and structures on the Jordan River, where Christian pilgrims are given the opportunity to undergo baptism, having received a certificate. The Yardenit complex was built in 1981 and includes a gift shop, restaurant, affordable car parking and everything you need to wash: changing rooms, the ability to purchase or rent special clothes. Every year at least 400 thousand pilgrims and tourists visit this place. The complex is controlled by residents of the Kwutz Kineret kibbutz, which is located next to Yardenit. Tilapia, carp and catfish abound in the waters of the Yardenit complex in the waters of the Jordan, which are almost like tame ones besieging the banks of the river in search of food generously provided by tourists. According to the Gospel tradition, it was Tilapia who was caught many times by St. Peter, who by his first profession was a fisherman. One of the most common restaurant names for tilapia today is St. Peter’s Fish, which you can enjoy in the restaurant of the complex. According to Christian history, the baptism of Jesus (Matt. 3:13) actually took place in the Jordan River near the village of Bethabarah, which was considered to correspond to the present Qasr El Yahud, north of the Dead Sea. Capernaum (Kafarnaum, Kfar Nahum – the Hebrew. “Village of Nahum”) is an ancient city located on the northwestern shore of the Geniseret (Tiberias) lake. The city is mentioned in the New Testament. Jesus Christ preached in the synagogue of Capernaum and performed many miracles in this city. The Gospels speak of Capernaum as the principal residence of Christ the Savior after He left Nazareth. The city was founded about 2500 years ago. The trade routes from the Mediterranean coast to Syria and Asia Minor ran through Capernaum. According to the Gospels, the main preaching work of Jesus Christ took place in Capernaum. Then the city was a fishing village and customs on the way from Caesarea to Damascus. In Capernaum, Jesus found his apostles — Peter, Andrew, the brothers of Zebedee, John the Divine and James and Levi Matthew. It is interesting that the name of the city was used by F. M. Dostoevsky in the novel Crime and Punishment. Sonya Marmeladova rented an apartment at the tailor Kapernaumova. Thus, the writer connects her image with the image of the Evangelical repentant harlot, with whom, in the Catholic tradition, Mary Magdalene, a native of Magdala near Capernaum, was identified for a long time. Next to Kapernaum is the Greek Orthodox Church of the Twelve Apostles. 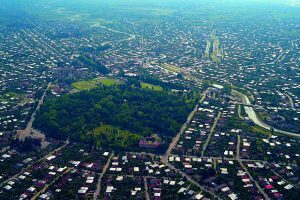 Korazin (Khorazin) or Korazim – it was an important Jewish city during the Second Temple. 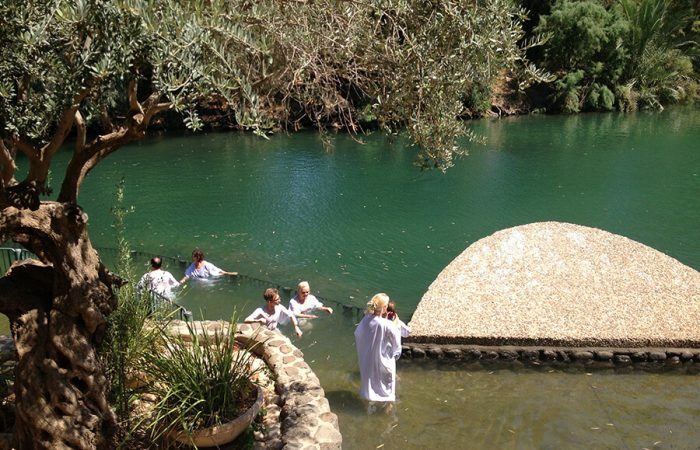 It is located in the Upper Galilee, 3.5 km north of Capernaum. It was destroyed before 339. Now it is a hill. Most of the buildings are made of black basalt. During the excavations, remains of a synagogue from the 3rd-4th cc. An architectural and archaeological reserve is set up in Corazime. Jesus Christ often visited Chorazin and did many miracles and signs here and reproached his inhabitants for lack of faith (Luke 10:13, Matthew 11: 2). 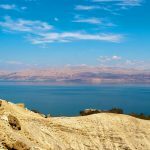 An ancient boat (the time of Jesus Christ), which is 2,000 years old, was found at the bottom of the Lake of Ginisaret (Lake Kinneret). The remains of the boat, 8.27 meters long, 2.3 meters wide and with a maximum preserved height of 1.3 meters, were found in the mud during the drought, when the water from the lake receded. The boat was found by Moshe and Yuval Lofan, fishermen of Kibbutz Ginosar. Brothers are archeological enthusiasts interested in finding artifacts. Understanding that the remains of the boat are of great historical significance for both Jews and Christians, archaeological excavations began, with the participation of members of the kibbutz, the Israel Antiquities Authority, and numerous volunteers. Archaeologists managed to pull the boat out of the mud without damaging it, before the water rose again. It was a difficult process that lasted 12 days. After that, the boat was immersed in a chemical bath for 7 years, and then put up in the museum of igal Alon in the Kibbutz Ginosar. The boat is of historical significance for the Jews as an example of the type of boat that their ancestors used in the first century. for fishing and transportation across the lake. The boat is also important for Christians, because it was a boat similar to the one used by Jesus Christ and his disciples, some of whom were fishermen. Such as this, boats are mentioned in the Gospel 50 times. At the time of its construction there were a lot of Jewish settlements around the lake of Genesareth. At about the same time, along the shores of the lake, Jesus preached with his disciples, as reflected in the New Testament. It is possible that on such a boat they caught fish in the lake. Belvoir (translated from French – a beautiful view) is a hospital of the Hospitaller, located on the Naftali plateau and having the name in Hebrew “Kochav a-Yarden” (Star of Jordan). The fortress is located 20 km south of the Sea of ​​Galilee on a high (500 meters) hill above the Jordan Valley, and from it opens a stunning view of the lake and the Jordan Valley. The fortress was distinguished by its high symmetry, with rectangular walls reinforced with square towers at the corners and sides surrounding the inner square case with four corner towers and one tower on the western wall. The vaults on the inside of the walls ideally protected the inhabitants of the fortress from heavy siege weapons. The fortress of Belvoir served the sole purpose of being the main obstacle in the event of an attack on the kingdom of Jerusalem from the east. In the campaign of 1182, a battle took place between King Baldwin IV of Jerusalem and Saladin. In 1994, a park was created next to the fortress, where you can get acquainted with the works of the Israeli sculptor Igal Tumarkin. Located on top of the Mount of Beatitudes, near Capernaum and the Sea of ​​Galilee (Lake Kinneret). Managed by the Catholic organization Neocatechumenal way. The House has several conference rooms, prayer rooms, gardens and a library. The architectural design of the House of Galilee, its objects of art and the spirit of these places make it a unique attraction and recommended place to visit for travelers in the area of ​​the Sea of ​​Galilee. The building was built in a short period of time. The first stone was laid in January 1999, and the house opened in 2000. The project was led and inspired by the Spanish painter and architect Kiko Arguan, one of the founders of the neocatehumenists movement. The project was implemented by Italian, Spanish, Israeli, Argentine, Colombian architects, designers, engineers and craftsmen. The building is faced with the so-called “transparent” stone (serene rock), specially for this purpose, delivered from the quarries Fiorenzuola near Florence. The stone has an unusual grayish shade and it adapts well to the environment. The House of Galilee was opened by Pope John Paul II during his visit to Israel in 2000. The library was built in 2005. The center is considered to be a place where Christians will be able to have direct contact with the living tradition of Israel, following in the footsteps of early Christian saints “who returned to their Jewish roots in order to understand the meaning of prayers, holidays, and Jewish liturgies.” John Paul II, who demonstrated an example of rapprochement between Catholics and Jews, stressed the need to evaluate Jewish roots in order to discover genuine Christianity. Magdala (also Migdal) is an ancient city of Galilee, mentioned in the Bible as the birthplace of Mary Magdalene. Magdala is located approximately five kilometers north of Tiberias. The word magdala in Aramaic means “beautiful”, “great” or “tower”, in Hebrew migdal means “tower”. Under the name “Magdala” in the New Testament, the city is mentioned in the Gospel of Matthew: “And, having released the people, He entered the boat and arrived within the boundaries of Magdala.” The city is located on the shores of Lake Genisaret (also known as the “Sea of ​​Galilee” and “Lake of Tiberias”), at the southern end of the fertile Genisaret plain, in the former Nefhealimov tribe, not far from Capernaum. During archaeological excavations carried out on the site of Magdala, the ruins of the ancient synagogue of the period of Christ, the central square of the town (agora) and a monastery with a sixth-century church were found. Subsequent Christian pilgrims, such as the monk Epiphanius, testify to the existence of a church built on the ruins of the house of Mary Magdalene. In 1908, Archimandrite Leonid (Sentsov) acquired a large plot of land on the coast of the Sea of ​​Galilee with the source of St. Mary Magdalene. In 1962, a small church was built in honor of St. Equal to the Apostles, Mary Magdalene, on the Russian site acquired by Archimandrite Leonid (Sentsov) on the shores of the Sea of ​​Galilee. In the 90s of the 20th century, the walls inside the temple were painted with frescoes on evangelical themes related to the Sea of ​​Galilee. On the farmstead there is a large garden with grapefruit trees, as well as natural springs with healing water, one of which is warm radon. On September 1, 2015, the archaeological and religious center officially opened at the excavations of the ancient Magdala. This city on the northwest coast of the Sea of ​​Galilee (it’s also Lake Kineret) is, in all likelihood, the birthplace of Mary Magdalene. In this city Jesus Christ preached. Therefore, Christian organizations conducted excavations here, and therefore a beautiful church was built here. The remains of a town from the 1st century BC were found here: residential areas, shops, a unique synagogue. Here you can and the remnants of the once thriving fish processing industry. Fishing and fish trade were the main occupation of the inhabitants. Mount Favor with its unique round shape towers 588 meters above the Jezreel Valley. Tabor is a detached mountain in the Lower Galilee, 9 km south-east of Nazareth. Tavor (tabur) means actually central convex place, navel. This mountain is completely separated from the whole chain of mountains and rounded from the bottom to the top, which is why it got its name. The top of the mountain is an oblong, slightly depressed and resembles the eye cavity. For the first time, Tabor is mentioned in the Bible as the boundary of the lands of the three tribes of Israel: Zavullon, Issachar, and Nephallim (Josh. 19:22). The peak of Mount Tabor, from the time of Antioch the Great (218 BC) to the conquest and destruction of Jerusalem by the Romans under Vespasian, constantly served as a fortified place. Napoleon Bonaparte during his campaign to Syria in 1799, near Favor, won one of the victories over the Damascus Pasha Abdullah. The French, although they had lost up to 300 people killed and wounded, but got rid of the danger threatening them from Damascus, while they besieged Acre (Acre). Here the outlines of the biblical terrain, such as the ancient caravans moving along the ancient Sea route, are still visible. 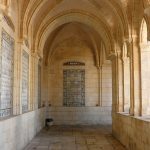 According to Christian tradition, Mount Tabor is considered a place of Transfiguration, and this is the very place where Jesus told the disciples not to tell anyone about what they saw on the mountain. 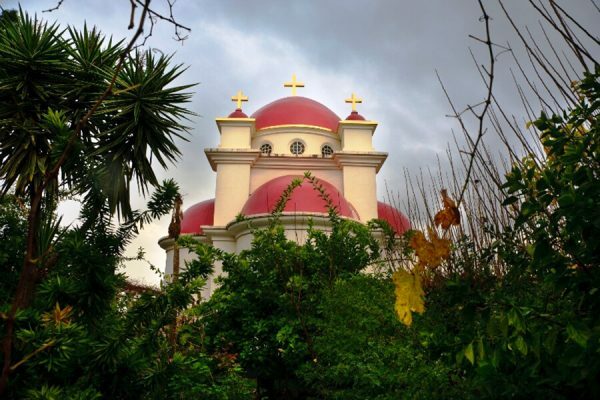 By the beginning of the 20th century, two new monasteries were built on Tabor, an Orthodox Greek one on the site of a Byzantine church, and a Catholic one on the site of a Tancred monastery. The monastery’s Orthodox church houses the miraculous Akathist Icon of the Mother of God, and in the aisle of Moses and Elijah, in the apse, you can see the stones of an ancient temple and fragments of a Byzantine mosaic. On the territory belonging to the monastery there is a cave temple of Melchizedek. The construction of an Orthodox monastery was largely conducted with money sent from Russia. A majestic Basilica of the Transfiguration of God (architect Antonio Barluzzi) was built in the Catholic Franciscan monastery on the ruins of the temple of the Crusader times and earlier ruins, with remains of a Byzantine monastery nearby. The monastery has a small hotel for pilgrims. Cana of Galilee is a Bible-known settlement in Galilee on the way from Nazareth to Tiberias, where Marriage was and where Jesus performed his first miracle: turning water into wine (John 2: 1). He warns his mother, “My hour has not yet come,” but at her request, he does not refuse to help the bridegroom. The Orthodox and Catholic traditions see this as an expression of the special power of the prayers of the Virgin for people. The Catholics called here the temple are called the “Church of the Lord’s wedding” and consider that the marriage concluded in this temple is the happiest and most reliable. Next to the church is the Orthodox Greek Church of St. George the Victorious, built with the money of the Imperial Orthodox Palestinian Society of Russia. In Cana there is the Greek Catholic Church of Sts. ap. Bartholomew, a disciple of Jesus, who was from Cana. Cana of Galilee is mentioned several times in the Gospel of John. Later, Jesus once again stayed at Cana of Galilee and during his stay there performed a miracle of healing with a word. It also indicates that the disciple of Christ Nathanael was from Cana of Galilee (John 21: 2). Nathanael is identified by most biblical scholars with the Apostle Bartholomew. Megiddo is a hill in the western part of the Jezreel Valley, near the modern settlement of the same name and 10 km from the city of Afula. 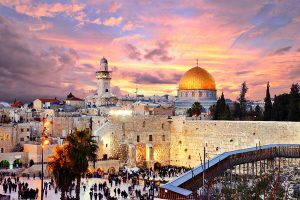 Known mainly due to the Greek word Armageddon, which is a transliteration of the Hebrew phrase Har Megiddo. In antiquity, Megiddo was an important city-state. The excavation has 26 cultural layers, this suggests that the settlement existed here for a very long time. Megiddo is located near a strategically important passage through the Carmel mountain range. Megiddo ran through key trade routes and military routes. It is protected by the state as a national park. In 2005, together with the Hatsor and Beersheba hills, the hill of Megiddo was declared by UNESCO a World Heritage Site. Megiddo has had many decisive battles in the contiguous Jezreel Valley. So, only 300 people led by Gideon defeated the huge army of the Midianites (Judges 7: 19-22). King Saul and his son Jonathan died on the nearby Mount Gelboi, where the Philistines defeated the Israeli army (1Kings 31: 1-7). Mongolian troops, which captured most of Asia in the thirteenth century, suffered their first defeat in this very valley. In 1799, Napoleon defeated the troops of the Ottoman Empire. In 1918, English General Allenby defeated the army of the Ottoman Empire. Napoleon called this place ideal for battles. This battlefield can accommodate two hundred thousandth army. Armageddon is the place of the last battle between good and evil (angels and demons) at the end of time in the end of the world, where “the kings of the whole inhabited earth” will take part (Rev.16: 14-16). Probably Megiddo and “the mountain of Israel.